We have been translating more blog content to help you find the topics and tips most relevant to you. With this commitment, we have just launched a new layout and style for the Majestic blog which should make searching for content far more efficient. There is more white spacing for a much cleaner and modernised layout. Titles and images are much easier to view and the genre of post is more noticeable. We have also made social sharing a lot more proficient. 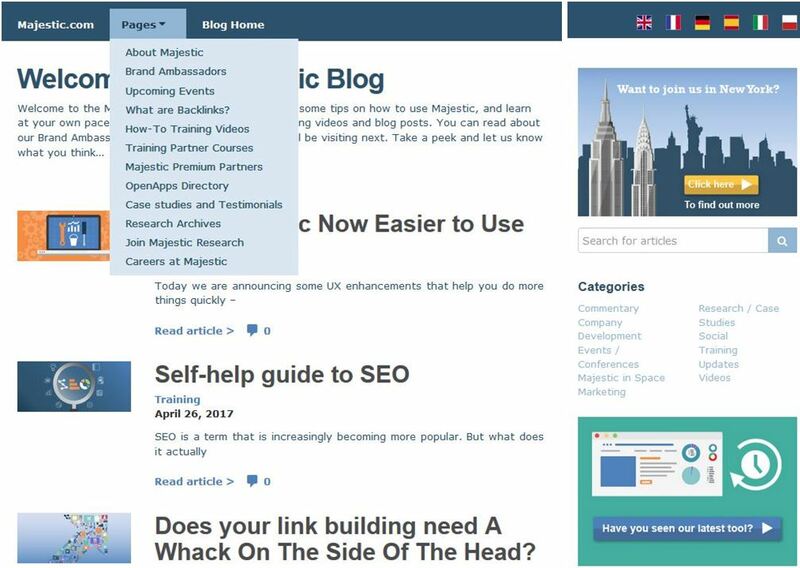 You can still read localised content by selecting the flag in the top navigation pane as well as explore other sections of the blog, via the Pages section, and discover the latest training videos and OpenApp tools. Along with this we will also give you the opportunity to engage more with Majestic through a set of revolving announcements on the right-hand side of the page – about latest events, features, development updates or site news; providing you with the most up to date information coming out of Majestic. In phase two of the project there will be other updates so make sure to keep an eye out for further changes and let us know if you have any feedback we can incorporate in the future.